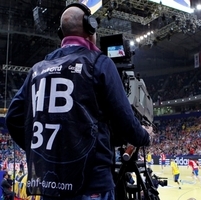 The sports rights agency of ARD and ZDF, SportA, has acquired the exclusive media rights for the Men’s EHF EUROs 2016 in Poland and EHF EURO 2018 in Croatia. The agreement covers all audio-visual rights for Germany and was closed by Infront Sports & Media, the European Handball Federation's exclusive marketing and media partner for EHF EURO events. Under the agreement, the public service broadcasters (ARD, ZDF and the regional channels) will transmit all matches of the German national team along with other highlights of the two tournaments. As a result German fans can look forward to extensive free-TV coverage of the EHF's national team flagship events in 2016 and 2018. In Poland, the host broadcast will be handled by POLSAT and supervised by Infront. The TV signal will be produced in HD quality using up 15 cameras per game. The Men’s EHF EURO 2016 will take place from 15 to 31 January in the cities of Krakow, Katowice, Wroclaw and Gdansk in Poland. In total, 16 teams including Germany, will play 48 games fighting for the prestigious European Championship title. The Men’s EHF EURO 2018, takes place from 12 - 28 January in Croatia. The second phase of qualification for EHF EURO 2018 will be played from October 2016.